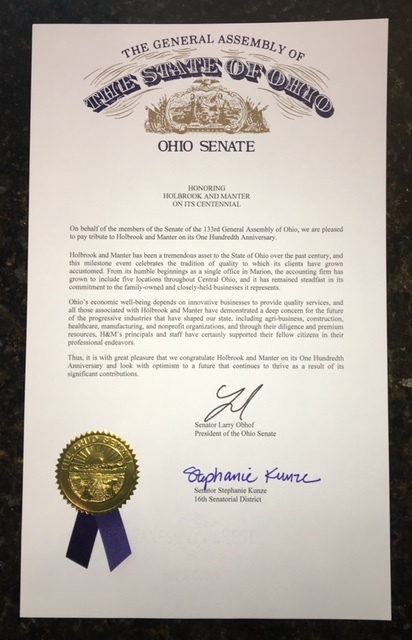 The Ohio State Senate has formally congratulated Holbrook & Manter on our 100 years of innovation and economic development in the state. This past century of success is a testament to our neverending dedication to our clients. Holbrook & Manter’s unique ability to uphold its foundational traditions while leading the way when it comes to accounting ingenuity has allowed us to thrive throughout Central Ohio – and we look forward to continuing to serve our clients on a personable level with a long-term vision. Here’s to Another 100 Years of Tradition & Innovation!